There are some upsides to keeping absolutely everything, particularly when it comes to finding out what went on in the past. My stepfather was a great keeper of stuff, a trait he'd inherited from his mother. She kept everything that mentioned her father, Will Dickens, and my stepfather in his turn kept everything too. He'd never known his grandfather, for Will was in that sad cohort of servicemen who died after the Armistice was signed. 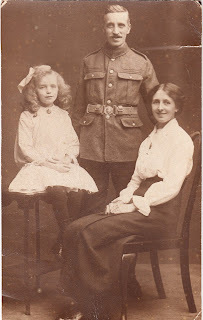 William Thomas Dickens was born on 27 March, 1879 in Northampton, the son of William and Ellen Dickens. He worked as a carpenter and joiner for Henry Martin Ltd, the same company as his father, and on 14 May 1905, he married Edith Gordon at St Edmund's, Northampton. They set up home at 151 Loyd Road in Northampton and their only child, a daughter, Margaret (Margie), was born on 6 July 1907. 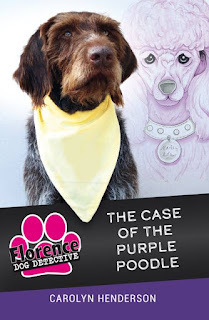 Carolyn is also a dog person, and her latest novel, Florence: Dog Detective (go to Facebook page All Because of Fredato buy, or try Carolyn's website) is for readers of eight years and older, including big kids of any age. All profits go to All Because of Freda, a rescue and re-homing organisation that helps dog here and abroad. As usual, a horse managed to sneak into the story. And now it's time to find out what other horses have sneaked into Carolyn's life. Gillian Baxter doesn't need much of an introduction from me: she's written some of the best-regarded pony books out there. She's the author of Jump for the Stars, The Difficult Summer, Tan and Tarmac, The Stables at Hampton, and the Pantomime Ponies series, to name just a few. 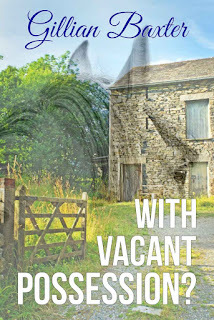 She's now writing again, with With Vacant Possession?, the story of a woman who moves to a remote Welsh farm with her horses, and gets a lot more than she bargained for. So I'm really excited to be able to hand over to Gillian to tell you about what books she would (and wouldn't) take away on a desert island with her. What books would I like to have beside me on my desert island? First, a book that will transport me home to the scents and sounds and weather of the British countryside, and the thrills and struggles of a brilliant but difficult pony.